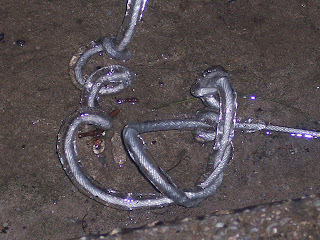 First, I have to do my artsy ice coating pictures. The first, a leaf and the surrounding grass. 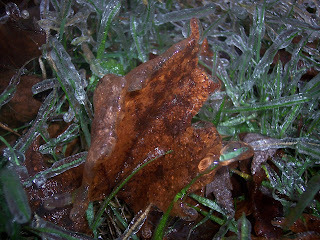 Each blade of grass was encased in ice and you could pick up the leaves like mini-ice sculptures. 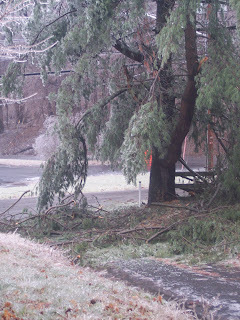 This is our driveway, covered in downed pine tree branches. More came down to the right and blocked half the road in front of our neighbors' house. A tree also fell across the street in the park and landed on a power line and there was a downed line right across from our house. 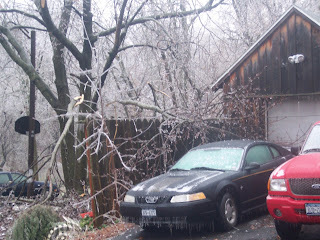 In the backyard, five or six branches came off another pine tree and landed on the back of the garage and the pool. Thankfully, the pool isn't in use nor will it ever be in use, so it isn't really damage we are unhappy about. We're going to eventually take it down anyway. 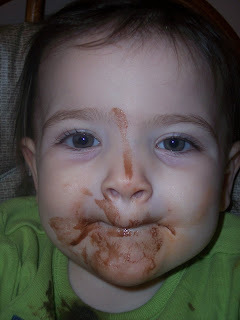 And now, for the "ice cream" partof the post. I put up the video of the girls eating their ice cream. Here is the happy aftermath: First up is Lily and second is Eve. I love those faces!! They look pretty darned happy! I've heard all about that storm - WOW! 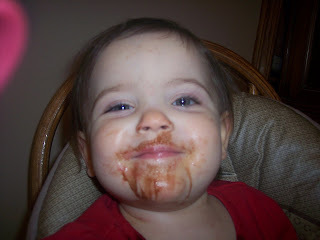 Those pictures of the icecream faces are too darling! Your storm sounds crazy! Cool pics.